After Phil Laak and Jeff Lisandro captured gold bracelets in the first two events at the 2010 World Series of Poker Europe respectively, event No. 3 (₤1,075 no-limit hold’em) was looking to be just as historic. However, Scott Shelley put an end to defending champion J.P. Kelly’s chance to repeat. Shelley won his first bracelet and took home ₤133,857 in prize money. Kelly — a two-time bracelet winner — entered the final table third in chips and held strong, before eventually dueling heads-up for the bracelet against Shelley. Kelly was not only looking for a remarkable repeat (the last player to win back-to-back WSOP hold’em events was Phil Hellmuth in the 1990s), but also had the chance to become the youngest triple-bracelet winner in the history of the WSOP. The 24-year-old British pro was looking to shatter Phil Ivey’s mark of 26 years of age. Nicky Katz was the first casualty of the day when he fell in ninth place for a payday of £10,633. It was the man with history on the line who made the elimination. Katz raised to 21,000 from middle position, and Kelly called from the big blind. The flop came A Q 8 , and Kelly checked. Katz bet 25,000, and Kelly raised to 63,000. Katz decided to move all in for not much more. Kelly made the call and exposed the J 10 for a straight draw. Katz was in the lead with the A 3 . However, the 9 fell on the turn, giving Kelly the nuts and a lock on the hand. Kelly had over 300,000 after scooping the pot. Kelly had a hiccup shortly after when he moved all in with the A 2 into the short stack of Jack Lyman. Lyman had Kelly’s ace dominated, and it held, dropping Kelly to 240,000. While Kelly was heading in the wrong direction after the early knockout, Shelley was short stacked and ready for a double up. He found it in an unlikely way. Karim Jomeen had the button and raised to 25,000. Shelley moved all in from the small blind for 165,000. Paul Pitchford folded in the big blind, and Jomeen called with the A A . Shelley tabled the 7 4 . The flop came J 5 4 , giving Shelley a pair and some hope. He caught the miracle when the 4 fell on the turn, giving him trips and putting him in great shape to double up. The 7 improved Shelley’s hand, and he was back in the mix. Jomeen was crippled with just 6,000 chips and was eliminated shortly thereafter in eighth for a payday of ₤13,694. After Shelley’s double up, Kelly found one of his own. The hand began when Shelley raised to 29,000, and Kelly made the call from the small blind. Lyman called from the big blind. The flop came Q 8 4 , and Kelly and Lyman were able to get all the chips in the middle, with Shelley ducking out of the way. Kelly tabled the 8 8 for middle set and was all in for about 250,000 total. Lyman exposed the A 7 for a flush draw. The turn and river bricked for Lyman, and Kelly doubled to 515,000, good for the chip lead at the time. Lyman was in free-fall and eventually hit the rail when his A Q was unable to hold up versus the A J of Shelley. Lyman finished in seventh place for a payday of ₤17,768. After starting the final table with a short stack Shelley was on a roll. Not too long after eliminating Lyman, Shelley knocked off Mehdi Senhaji by winning a coin flip. Senhaji, who finished in sixth place and took home ₤23,239 for his efforts, gave Shelley 870,000 in ammunition. Kelly continued to do the work at the final table as well. He finished off Kaveh Payman when his A K held against his opponent’s inferior ace. Payman was gone in fifth for a score of ₤30,666. Shortly after, Kelly eliminated the 11,000-chip short stack of Pitchford. Pitchford took home £40,862 for his fourth-place finish. And yet another elimination occurred at the hands of the defending champion. Kelly eliminated Jeppe Bisgaard in third place. Bisgaard was rewarded with ₤55,063 for his deep run. The back-to-back-to-back knockouts for Kelly gave him the chip lead with 1,030,000 to Shelley’s 720,000 when heads-up play began. The pair went back and forth for awhile playing small pots, with Shelley winning a majority of the confrontations. Although Kelly was able to double up once and get back in the lead, he wasn’t able to overcome the momentum of Shelley. The final confrontation began when Shelley raised to 47,000 on the button, and Kelly deliberated briefly before moving all in. Shelley made the call and exposed the 3 3 . Kelly was racing for his tournament life with the Q J . The flop came 8 5 3 , giving Shelley a set and a strangle-hold on the hand. The 7 on the turn made it so Kelly was drawing dead for his third bracelet. The meaningless 10 fell on the river, making it official. 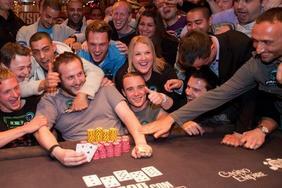 Kelly took home ₤82,854 in prize money as the runner up and Shelley won ₤133,857 and his first gold bracelet. The next WSOP Europe gold bracelet will go to the winner of event No. 4 (₤10,350 no-limit hold’em high roller heads-up). You can check out a recap of the final table on Card Player after the conclusion of the tournament. Live updates from the ₤10,350 no-limit hold’em main event will begin on Thursday, Sept. 23.